(CNN) -- The Rev. Franklin Graham has arrived in North Korea bearing a gift for North Korean leader Kim Jong Il, the country's official news agency reported Wednesday. The Rev. 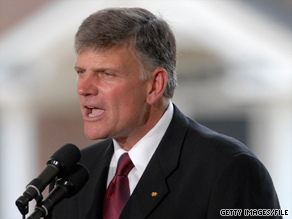 Franklin Graham reportedly will oversee the delivery of $190,000 in equipment for a dental school. Graham handed the present, which was not identified, to a high-ranking official Wednesday to give to Kim, the Korean Central News Agency reported. Graham, the son of the Rev. Billy Graham and the president of Samaritan's Purse, arrived Tuesday in North Korea's capital, Pyongyang, KCNA said. On its Web site, Samaritan's Purse said Franklin Graham was to meet with high-level government officials and to inspect medical facilities that the organization has installed. "I believe it is important to make visits like this to help improve relations and to have a better understanding with each other," Graham said, according to the Samaritan's Purse Web site. The group said Graham will visit a hospital and also will oversee the delivery of $190,000 in equipment to outfit a dental school that can train up to 70 dentists per year. KCNA reported that Graham said he hoped he could act as a bridge for better relations between the United States and North Korea. The visit marks Graham's third trip to North Korea. His father visited the country in 1992 and 1994 and met with President Kim Il Sung, Samaritan's Purse said. His mother, the late Ruth Bell Graham, attended a mission school in Pyongyang in 1934, the organization said. Later this week, Graham is scheduled to travel to China, where he'll dedicate a clinic that Samaritan's Purse built, visit a city destroyed by last year's earthquake and speak at churches, the organization said.